Chester have signed 20-year-old Wigan Athletic winger Danny O’Brien on loan until the end of the season. O’Brien played for the Blues on loan at the same time last season scoring one goal (at Altrincham) in 7+2 appearances. The Blues suffered a 3-1 defeat at Dover Athletic on Saturday missing an opportunity to close the gap on their play-off chasing opponents. Manager Jon McCarthy gave a start to Matty Waters and recalled Liam Roberts in goal for the match. Dover had the better of the opening exchanges, and despite Chester coming more into the game, took the lead on 25 minutes. Leading scorer Ricky Miller worked his way onto the box before being fouled by Waters. Miller send Roberts the wrong way from the resulting penalty. James Alabi scored a great equaliser five minutes curling a shot past Steven Arnold in the home goal from the edge of the box. Miller was lucky to escape a red card following a late challenge on Johnny Hunt, the Whites striker having previously received a yellow card. 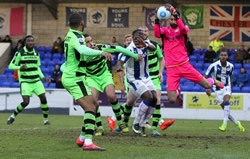 The decision would cost Chester as Miller raced through early in the second half to restore Dover's lead. 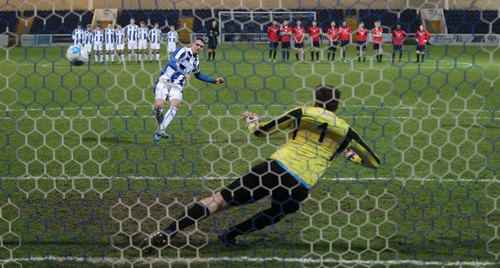 It was game over on 57 minutes as Joe Healy added a third goal for the hosts. The defeat sees Chester slip to tenth in the league and the Blues face another tough trip on Saturday when they travel to third placed Dagenham & Redbridge. Manager Jon McCarthy has signed a new 2½ year deal at Chester which takes him to the end of the 2018/19 season. McCarthy took over when Steve Burr was sacked in April 2016 and won three of the four remaining games of the season to steer the Blues away from the relegation zone. This year Chester have continued to improve and lie six points from a play-off place thanks to a run of 17 matches with just one defeat leading up to Christmas. The home league against Tranmere Rovers will now take place on Friday 3 March with a 19.45 kick-off. The game is still being screened live by BT Sport. 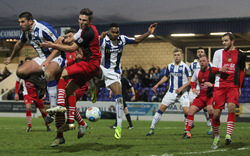 Chester came from a goal down to draw an entertaining derby match with Wrexham on Saturday, James Alabi netting the equaliser from the penalty spot. The Blues finished the game following a red card for Luke George 15 minutes from time. Chester had the better of the opening half that saw a header from man of the match Ryan Astles come back off the bar and Alabi having a ‘goal’ ruled out for offside following an Elliott Durrell corner. At the other end Izale McLeod blazed over when well placed to miss Wrexham's best chance of the half. Wrexham started the second half brightly and took the lead in the 53rd minute with two former Blues combining as Anthony Barry’s cross was met at the far post by John Rooney who beat Alex Lynch to score. The Blues were back on level terms six minutes later as Alabi cut inside from the right and after a couple of stepovers was adjudged to have been fouled by James Jennings in the area, referee Craig Hicks duly pointed to the penalty spot and Alabi crashed the ball home in front of the Harry McNally Terrace. Lynch pulled off a tremendous save to deny Mark Carrington as the game flowed from end to end. Eleven minutes from time George received a second yellow card and his marching orders after a short Theo Vassell back-pass had led him to dive into a tackle. Wrexham pressed in the final minutes with both Jordan White and Rutherford going very close to finding the winner but Chester hung on for a share of the spoils. Theo Vassell is to remain at Chester until the end of the season after Walsall agreed to extend his loan spell. The deal also allows the 20-year-old defender to play for Walsall reserves during his time at Chester. Vassell has so far made 15+1 appearances for the Blues, scoring one goal in the 2-3 away defeat at Barrow. Two well taken goals from Marcus Kelly either side of half-time gave Forest Green Rovers a 2-0 victory at Chester in the second round of the FA Trophy on Saturday. The visitors had plenty of early possession as Christian Doidge headed over from close range and Alex Lynch produced a top save to deny Fabien Robert's volley from 12 yards to keep Rovers out. Two minutes before the break though Kelly sent a curling effort past Lynch from the edge of the area. Chester started the second half well, Tom Shaw saw a close range effort saved by 'keeper Sam Russell and Russell was in action soon after to save a Kane Richards effort. On 58 minutes though Kelly struck again from 20 yards giving Lynch no chance with another fine strike. Despite seeing plenty of the ball Chester couldn't break down their opponents who comfortably held out for victory. Chester are back in league action on Saturday with the all-ticket cross border derby at home to Wrexham, kick-off 15.00hrs. The home game against Tranmere Rovers on Saturday 4 March will be screened live by BT Sports, kick-off now at 12.15. A young Chester side were knocked out of the Cheshire Senior Cup 5-4 on penalties by Hyde United tonight in front of a crowd of 338. The Blues led 2-0 late in the game with goals from Matty Waters and James Jones, only to concede two quick goals to force 30 minutes extra-time. Chester went 3-2 ahead early in extra-time through Nathan Brown before being pegged back again to force the penalty shoot-out. Chester: Roberts, Downes, Evans, Hunt, Joyce (Rowbottom), J.Jones, Edwards, Waters, Ap-Gareth, Marsh (Thomson), Brown. Subs: Hodges, E.Jones, Crayston. Two goals from James Alabi saw Chester come from behind to beat Braintree Town on Saturday. The Iron had dominated the opening 45 minutes and were ahead through a Jack Midson goal on 30 minutes. Earlier Elliott Durrell had headed a Manny Parry effort off the line as the home side pressed Chester back. The Blues, playing with the slope, started the second half brightly and almost drew level as birthday boy Matt Waters saw an effort go over the bar following good work from Durrell. Chester drew level on 61 minutes as Kane Richards used his pace to great effect to race down the right and cross for Alabi who headed past Sam Beasant at the near post. Six minutes from time Alabi found the net again after receiving Tom Shaw’s measures pass and shooting past Beasant. The lively Alabi almost grabbed a hat-trick but saw a long range effort go over in the dying minutes. The victory lifts Chester to ninth in the division and are back in action when they take on Hyde United at home in the Cheshire Senior Cup first round on Tuesday night, kick-off 19.45hrs. Ryan Lloyd has had his loan deal from Port Vale extended until the end of the season. The news comes as a big boost to the Blues as the young midfielder rejected a chance to move on a permanent deal to Southport. The Sandgrounders had tabled a bid for the 22-year-old player, which was accepted by the Valiants, but Lloyd chose to stay with Jon McCarthy’s team and will be available for the trip to Braintree Town tomorrow. Tickets for the forthcoming home league match against Wrexham on Saturday 21 January (kick-off 15.00hrs) are now on sale at the club office to CFU members from 10.00-16.00hrs. They will then go on general sale during the dame hours from Monday 9 January. Tickets will also be available 18.30-19.30 before the Cheshire Cup game with Hyde United on Tuesday 10 January. Tickets will be available after the FA Trophy game against Forest Green Rovers on Saturday 14 January from 17.00hrs. Tickets will also be sold on Sunday 15 January from 10.00 to 16.00. Season Ticket holders and Cestrian 10 ticket holders will use the appropriate voucher from their ticket books. Tickets will NOT be sold on the day of the match. 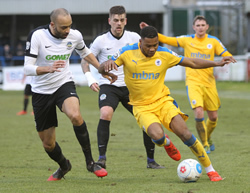 “An absolute disaster” was how manager Jon McCarthy described Chester’s home defeat by Solihull Moors on New Year’s Day to complete a miserable festive period for the Blues. Solihull followed up their 3-2 Boxing Day victory with a comfortable 3-0 victory through goals from Jamey Osborne, Liam Daly and Harry White. Chester started the match brightly with Sam Hughes hitting the bar after six minutes but it was Moors who took the lead, against the run of play, on 17 minutes with Osborne firing home a loose ball after an initial effort had come off the post. The visitors doubled their lead early in the second period after Alex Lynch had failed to clear a Sterling-James free-kick and Daly scored into an unguarded net. Twelve minutes from time the game was sealed when Luke George was adjudged to have handled in the penalty area, Harry White converted the spot-kick to complete the misery for the Blues. Chester are back in action on Saturday when they travel to Essex to play Braintree Town, kick-off 15.00hrs.